The right tools make your workforce more productive. Wireless Webforms Straight Line is a one-stop, web-based tool that connects your mobile workforce to any of your existing legacy systems, creating a unique and powerful virtual office. Our solution mobile enables any application, thereby strengthening your computing needs. Utilizing the Internet and Microsoft .Net architecture, Straight Line allows all portable devices running Microsoft operating systems to be configured with your workflow, and function easily within minutes or hours, not days or months. As a result, two-way seamless data transfer makes productivity and the quality of information flow more powerful than you ever imagined. What makes us different? We specialize in producing solutions that make any mobile workforce more productive, efficient, and accurate. And you don’t need to invest in additional infrastructure, or staff; because our ASP model gives you the freedom you need to concentrate on your business. Privacy and security are ever changing concerns. 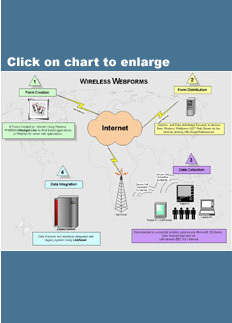 At Wireless Webforms, we employ the latest security practices and solutions to ensure your data is safe and to protect you from loss, misuse, or unauthorized access. And with our hosted services, you can be assured of the reliability and scalability you need, now and in the future.